This article and the information on this site are intended for general information only. The author is not a CPA, tax attorney, or Enrolled Agent. Consult with your tax professional for information relating to your specific situation. Foreclosure is a process by which a bank or other creditor takes back property from the debtor because the debtor has defaulted (failed to keep up the payments or to comply with other loan terms). Foreclosure is administered under the laws of individual U.S. states. A business buys a building or other property from a bank or other creditor. The creditor requires a security interest in the property, in case the borrower fails to pay. The purchase agreement contains a clause that allows the creditor to take back the property if the borrower defaults. In some cases, an acceleration clause is included in the agreement, which means the borrower may owe the entire amount if the loan is in default. The credit sends notice of default to the debtor, who is given a period of time, usually called a redemption period, to cure the default. The debtor can make the loan current, including penalties and interest, work out arrangements with the creditor, or declare bankruptcy during this time, which is set by state law. If the debtor is not able to cure the default within this time period, the property is seized and sold, with the proceeds going first to the primary lien holder and to others who hold liens on the property, with any remaining balance, if any, going back to the borrower. 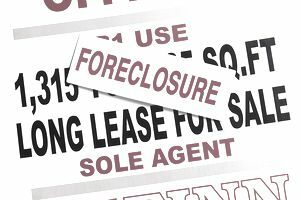 A foreclosure on a business property can occur without bankruptcy if the business owner cannot make the payments on a building or other property. It is common, however, for a business to be in trouble and to declare bankruptcy because it cannot pay any of its bills. Chapter 11 reorganization bankruptcy temporarily halts the foreclosure until the court approves the reorganization plan. Chapter 7 liquidation bankruptcy includes the foreclosed property in the list of assets to be liquidated. But bankruptcy does not mean that the debtor can walk away from the property under foreclosure; the property may be sold to pay the debts of the business. There might be ways to delay or prevent foreclosure. In each case, it is best to contact a bankruptcy attorney or financial adviser who is familiar with business bankruptcy. Refinance: You might be able to get the loan refinanced, either at the same lender or a through a different lender. Find Other Financing: You might be able to get help financing from friends, relatives, or investors other than your original lender. Personal Guarantee: Personally guarantee the loan, if you haven't already done so. This puts your personal assets at risk, but it might help if you feel the situation is temporary and it might allow for the possibility of refinancing later and taking off the personal guarantee. File a Restraining Order: Filing a restraining order against the lender might temporarily stop the foreclosure (depending on the terms of the purchase agreement). Declare Bankruptcy: As stated above, bankruptcy halts the foreclosure temporarily while the court works through the bankruptcy proceedings.